Nutracheck's nutrient tracking is effortless yet powerful - the benefits are already showing in my waistline and my overall health. Thank you Nutracheck! Chris Angel found himself at a turning point on New Years Day 2014 when he tipped the scales at 21st 12lbs294lbs133kg - his heaviest weight ever. I was the biggest I had ever been and my health was suffering. I had high blood pressure, I was prediabetic and my GP gave me a stark choice: take medication to control my blood pressure and the onset of diabetes - or lose weight. I didn't have to think very long about that choice because I knew the weight had to go. January 1 was dry and sunny - but it was actually a very dark day for me. I was ashamed of my weight and none of my clothes fitted me. I went out for a walk but could only manage around 15 minutes of exercise because my lower back ached from the strain of carrying my stomach around. I felt incredibly sorry for myself but the self-pity didn't last long because I had to face up to the fact that I had done this to myself - and no-one except me could undo it. I set myself a goal to get down to 16st 6lbs230lbs104.5kg by December 2014. I had managed to get down to this weight in the past so it was something tangible to aim for. And anger at my spiralling weight spurred me on! Nutracheck gave me the knowledge to take that control. 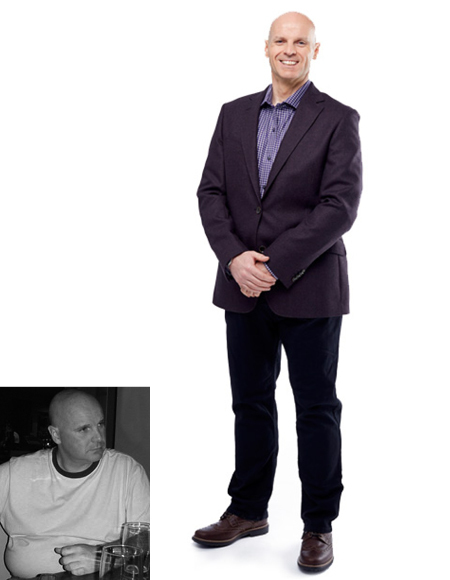 Naturally competitive, Chris immediately set about taking back control of his weight with the help of Nutracheck. My top tips are really simple: buy a digital scale to weigh what you eat - don't guess! And just be honest, which means logging everything you eat and drink. If you try to guess what 100g of something looks like you are likely to underestimate - so just get used to weighing your portions accurately and noting it all down. That's all there is to it. And by June, Chris had already smashed his target and gone on to get his weight down to double figures - but he didn't stop there. I have learnt so much! Nutracheck has given me the ability to use my knowledge to control and manage my weight loss. I have finally found a system that works for me, giving me the control and insight I need to stay on track and recover from any set-backs. And now that Nutracheck tracks and advises on nutritional content beyond calories, I can control my nutrition in a way that tailors the food I eat for my specific needs. It's effortless and yet powerful. Every human body is slightly different and understanding what macro-nutrients work for me personally has helped me already. I've noticed that my energy levels are more consistent, my ability to concentrate is vastly improved (eat more 'good' fats, people!) and I now have the ability to resist sugary temptation. It took some experimentation but Nutracheck's new features have made it all very easy. Having committed to a major fitness goal in 2017, I am very pleased that Nutracheck has launched macro-nutrient tracking so I can manage my calorie intake in a way that supports me. Nutracheck is part of my daily routine. It's incredibly easy to use, and offers tremendous customer support - there's lots of encouragement and tips so I don't ever feel I am doing this on my own - and that's made the world of difference for me. I can enjoy food without feeling guilty because I know I am in control - and that's a great feeling.